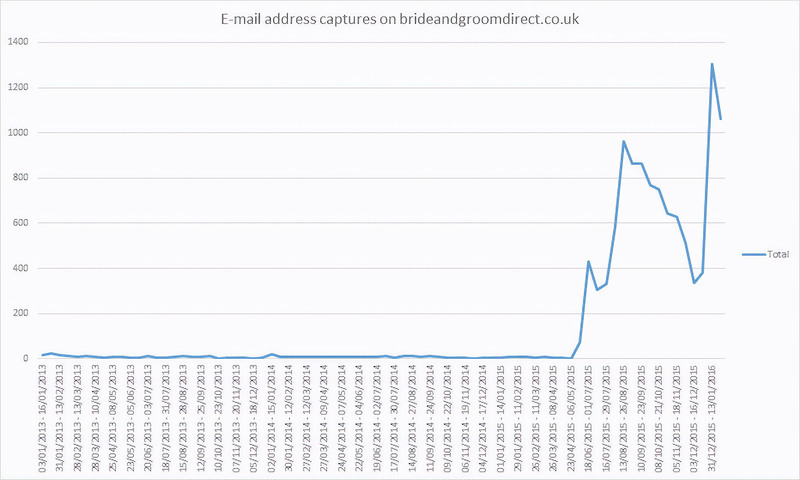 Take a Look at How Bride & Groom Direct Drove 200k in Extra Revenue With a Single Opt-in Form. 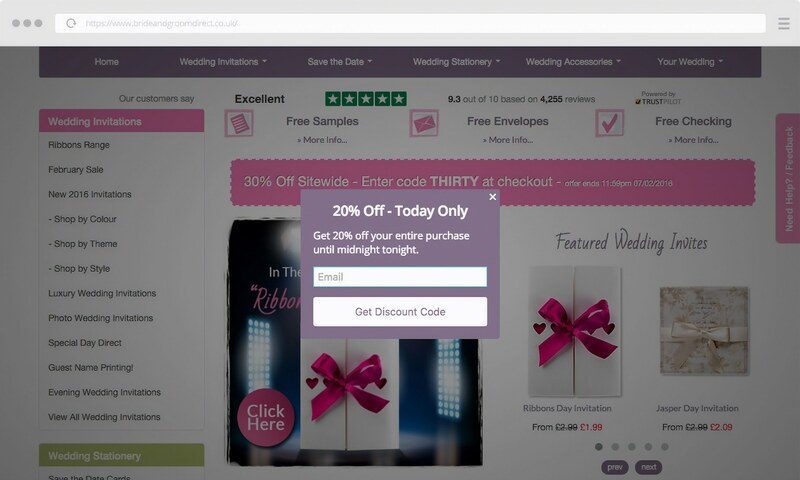 Using Gleam Capture Bride & Groom Direct were able to create powerful opt-in forms which increased their email signups by 1600% and drove over 200k in revenue. 2016 is a wonderful year to be a marketer. Great software is enabling anyone to deploy and scale campaigns like never before, usually without the need of complex internal development resources. For the past 9 months Daniel from Bride & Groom Direct has driven more than €200k from a campaign that took him little more than 10 minutes to implement with Gleam Captures. Bride & Groom direct were using a custom solution for collecting newsletter signups, but only averaging 6 opt-ins per day. But, they were consistently converting email opt-ins at 15%, so Daniel knew if he could increase the volume that he could also confidently impact overall revenue. Signups from Gleam have a much better open rate compared to our normal e-mail addresses. Daniel stumbled across our Capture app and knew that he could test various opt-in form ideas. 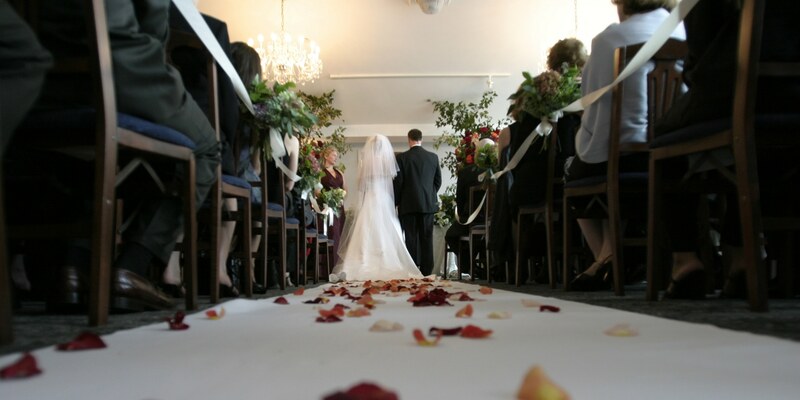 They run a lot of voucher code promotions and knew that their customers were very receptive to saving money (this is a wedding we're talking about after all). So his initial idea was to offer a 15% off discount for email subscribes, essentially incentivising users on the spot. 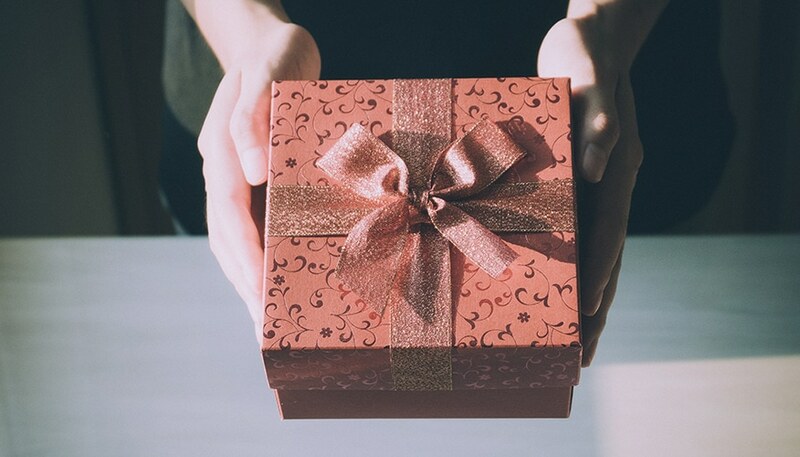 Daniel then connected this Capture up to Mailchimp so that opt-ins could flow through in real-time and receive a 10% discount via an autoresponder. 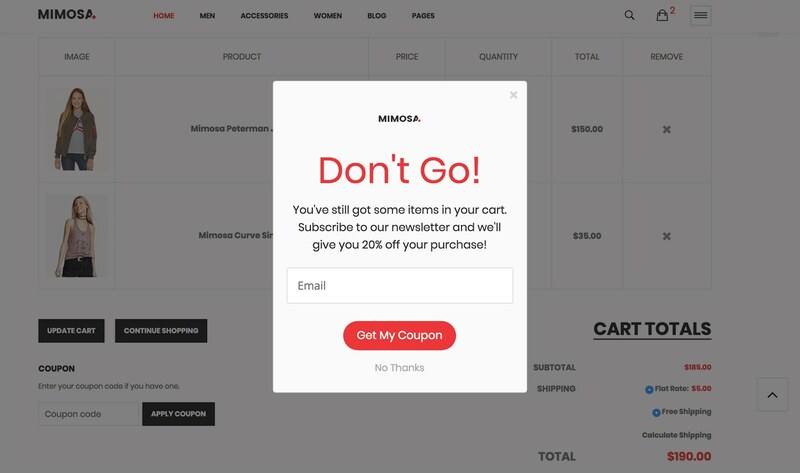 They also show the 15% coupon code in the post opt-in message. One day after implementation, Daniel looked at his reporting. His opt-ins had jumped from 6 per day to over 100 per day. The interesting thing is that even though the volume increased by 1600% the conversion rate to sale remained steady at 15%. Since implementing Gleam’s Capture we now get an average of 100 new customers per day. We convert around 15% of these users. This single Capture is now responsible for driving over €200k of sales for Bride & Groom Direct in the last 6 months and on track to contribute almost €300k for the year. The discount code has an AOV of £75 against a site average of £70. 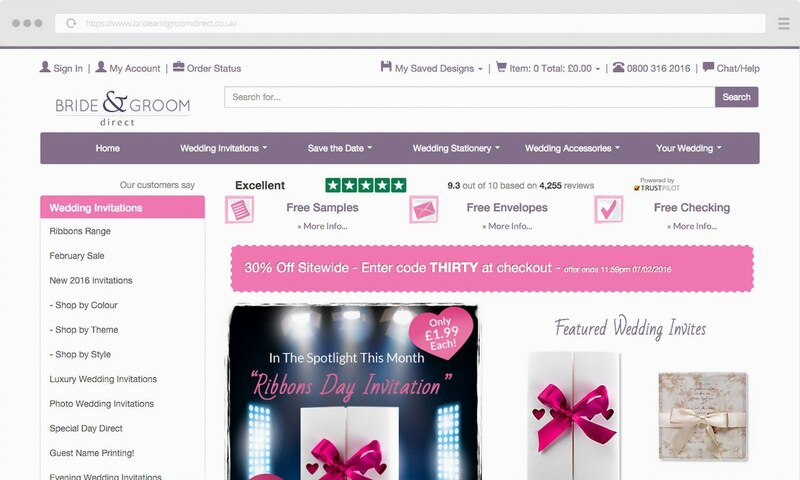 What can other businesses learn from the way Bride & Groom Direct has implemented Gleam Capture onto their site? 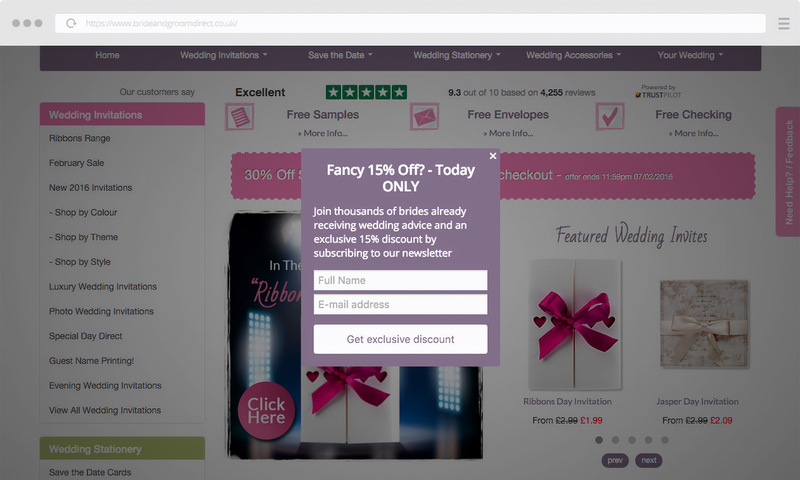 Bride & Groom Direct were able to increase their opt-in rate by 1600% by giving their users an incentive to subscribe. 10% to casual email subscribers. 15% for on the spot purchases. 30% for special sales and offers. Of course as a business you need to weigh up the cost of discount vs the potential increase in volume. Something interesting to note is that the users that redeemed the coupon code ended up spending an average of $5 more per order. This campaign shows that you don't need designers or fancy templates to try out something new. Daniel simply created an opt-in form using our Text Popup template then played around with the design and call to action in the backend. As you get a feel for what's working you can start to design more advanced templates for different marketing initiatives. Take a look at our examples and see what you can achieve with Capture. This is a hotly debated topic, should I risk annoying customers with a popup right away or wait until they are about to leave our site? Learn everything you need to start creating your own exit-intent popup in minutes. It’s also possible to set them up to show independently, or not show the exit popup if a user has already subscribed to the main one. We mentioned above that Daniel’s exit popup was converting much higher than the main one. It was only set to popup after someone was abandoning their shopping cart. It had vastly different messaging that created urgency. It had an extra 5% off your total order. Exit popups don’t get triggered by mobile devices either. Capture makes it easy for you to test and deploy different messages across different parts of your site. You can even create custom popups when users come to your site from certain traffic sources. Being able to track the outcomes of your campaigns is a crucial step in knowing what sort of return you are driving. Daniel knew the conversion rates of email subscribers, so he was able to track the upside of deploying the new campaigns. 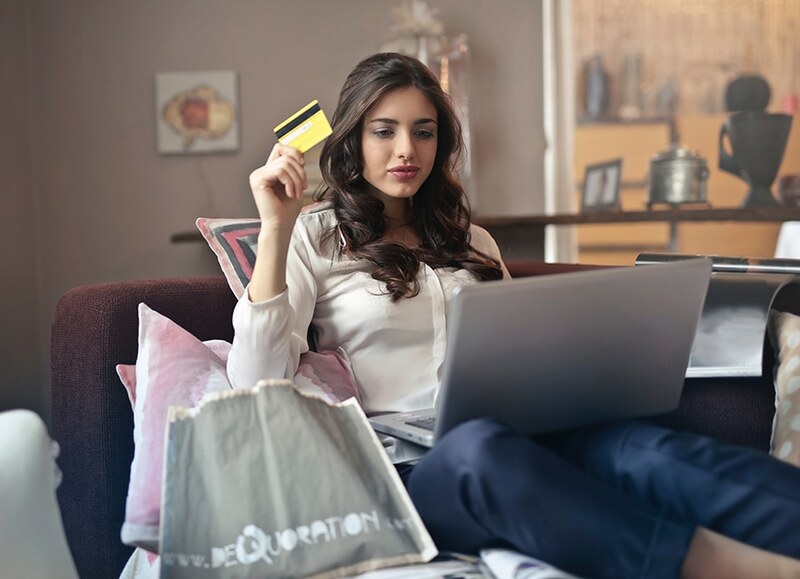 For him it was an easy equation, increase the conversion rates of the popups and he could reliably drive more revenue from potential customers. You can allocate unique coupons to specific opt-in forms so you can see the revenue for that particular opt-in. You could use Google Analytics to look at the conversion rates per Capture. If you track the source of customers in your backend you can allocate them to specific segments that include source signup.